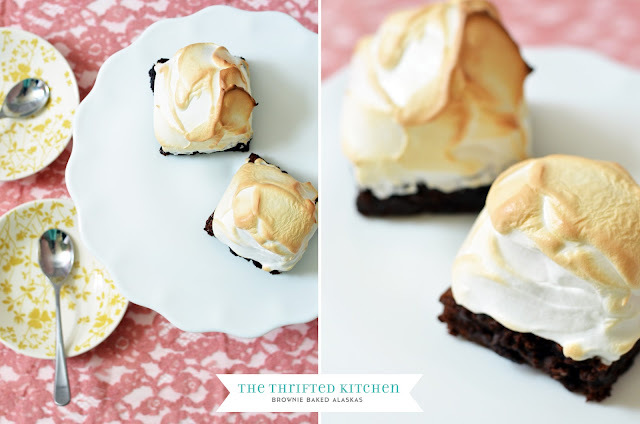 I've always been really intimated by Baked Alaska. I think mostly because I am really clueless when it comes to anything science-related, and I could not wrap my mind around how the heck you put something like ice cream in the oven and it comes out still frozen. So when I came across this recipe for individual brownie Alaskas in that Betty Crocker recipe box I thrifted last weekend, I thought it seemed a little less intimidating to tackle in individual portions. This way, I could bake them two at time, and if it somehow turned into a melty mess in the oven, it wouldn't ruin the whole batch. After all was said and done, though, it's actually pretty easy to make. The key is making sure that ice cream is frozen enough. So before I even started making the brownies, I put individual scoops of strawberry ice cream on a baking sheet lined with parchment paper and popped it in the freezer. Then, once the brownies were cooled, I cut them into 3-inch squares, put them on the baking sheet in the freezer, and was able to pick up each scoop and place it on top of the brownie. Baked brownies as directed on package. Cut into 3-inch squares; place on baking sheet. Top each with small scoop of ice cream and place in freezer 1 hour. Heat oven to 500 degrees. Beat egg whites until foamy. Beat in sugar, 1 tablespoon at a time; continue beating until stiff and glossy. 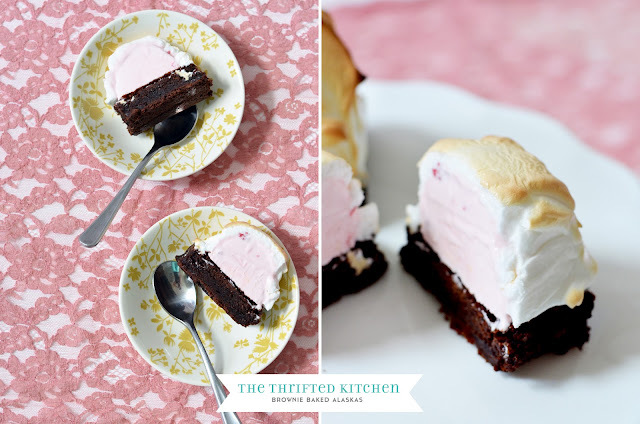 Cover brownies and ice cream with meringue, sealing it to the edge of the brownies. Bake 3 to 4 minutes or until meringue is light brown. Genius! And what gorgeous photos. YUM!!! This looks delicious and simple. Great photos.